"We think Repeat Signage is marvellous. We’re delighted with the support offered and when we’ve encountered a glitch their team have bent over backwards to help." "We think Repeat Signage is marvellous. We’re delighted with the support offered and when we’ve encountered a glitch their team have bent over backwards to help. 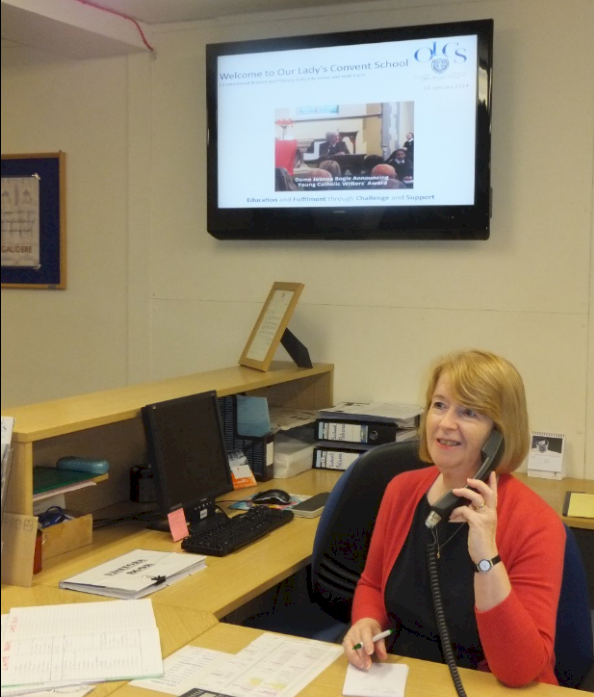 We currently use the software on a screen in our main school reception. The screen is personalised with our logo and a dynamic date. Images are uploaded with captions to give visitors and students a flavour of life at the school - a picture speaks a thousand words! When I have time I update the screen weekly with a mixture of photos from the previous week, to keep it fresh and the details of events and activities happening this week. When time is tight, such as this term, I periodically create a scrolling picture show which illustrates the range of activities, ages and genders we welcome into school. The software is so easy to access and change that if we have a VIP visiting, I can quickly format the screen to welcome them, making it an extra special welcome". Alexa Derbyshire, Our Lady's Convent School. Repeat Signage lets you quickly and easily create digital signage presentation on a Windows PC and connect to a display screen to promote your school activities.